« An Exciting New Massage Treatment! 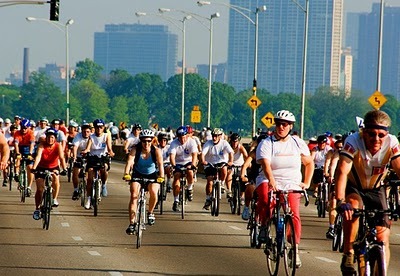 Spring Means Bikes Own Lake Shore Drive on May 30! According to the website: MB Financial Bank’s Bike the Drive provides you with hours of bicycling nirvana. Cruise up and down the entire length of Chicago’s famous Lake Shore Drive without a car in sight! Pedal as fast or slow as you want – it’s your ride! Take in the striking skyline as you breeze along sparkling Lake Michigan. Whether you are a racing star or you are bringing your family for a leisure ride, the MB Financial Bank Bike the Drive is the perfect way to kick off your Chicago summer! If you sign up for a Premium registration for $63, you also get a one year membership to *Active Transportation Alliance. Gold Package – only $75! More info on Registration packages and discounts here. Bike and Roll Chicago, the official bicycle rental company for MB Financial Bank Bike the Drive, is offering participants discounts on bike rentals. Rentals include a bike, helmet, lock and riding map. Helmets – which are required for the event – are also available for rental or for purchase. Find details here. Getting your packet has never been more convenient! Choose one of these many options so you can have everything you need for the big day. Self Pickup Stop by any of the packet pickup locations in the weeks leading up to Bike the Drive for free. Pickup time and locations are coming soon. We plan to have even more convenient locations this year. We want to make sure that the MB Financial Bank Bike the Drive is attended by paying participants only. The registration fee pays for the supplies and cost of the event, which is our largest fundraiser. We will ask participants to show their rider numbers and wristbands at checkpoints along the route. Any non-paying participants will be escorted Lake Shore Drive and given the opportunity to register on-site. Thank you for your patience! Hold on to your helmet! Our Gold Package and Platinum Package are the best way to save and get even more biking in 2010. What is the Active Transportation Alliance*? Based in Chicago, Illinois, the Active Transportation Alliance is a non-profit advocacy organization that works to improve conditions for bicycling, walking and transit and engage people in healthy and active ways to get around. For 25 years, we have led the charge for a transportation culture that values safety, health, sustainability and choice. Our expert staff and our committed board of directors are growing choices for transportation like never before. Formerly the Chicagoland Bicycle Federation, we create opportunities for people to move and travel safely, actively and enjoyably every day.